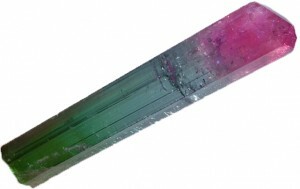 The Crystal Circle – The Blog | We invite you into the fascinating world of fine minerals! We invite you into the fascinating world of fine minerals! 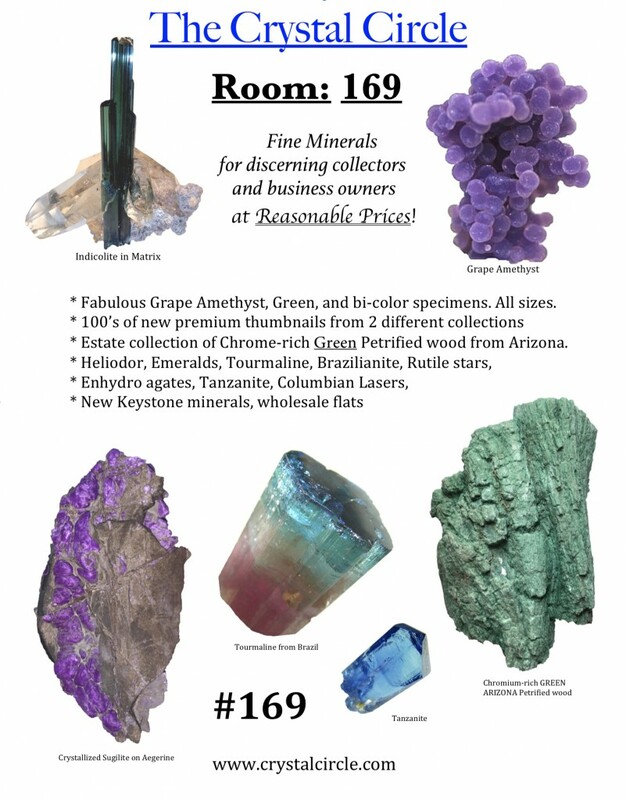 click on this link to view our PDF flyer for this local, awesome assortment of worldwide minerals, spheres, pendants, and much more. Metaphysical quality stones? Why do people collect minerals how do you get a good deal? I have been involved in the mineral, stone and fossil hobby since 1981 when I first began selling rocks from my own collection in the swap area of the Cincinnati Gem and mineral show. I became more involved in my teenage years, and had mined at over 30 sites by the time I was 21. After college, in 1997 I decided to begin this company, The Crystal Circle with my dad Jack, who at the time was a varsity soccer coach, but who had a degree in geology and had taught science class in an elementary school for many years as well. 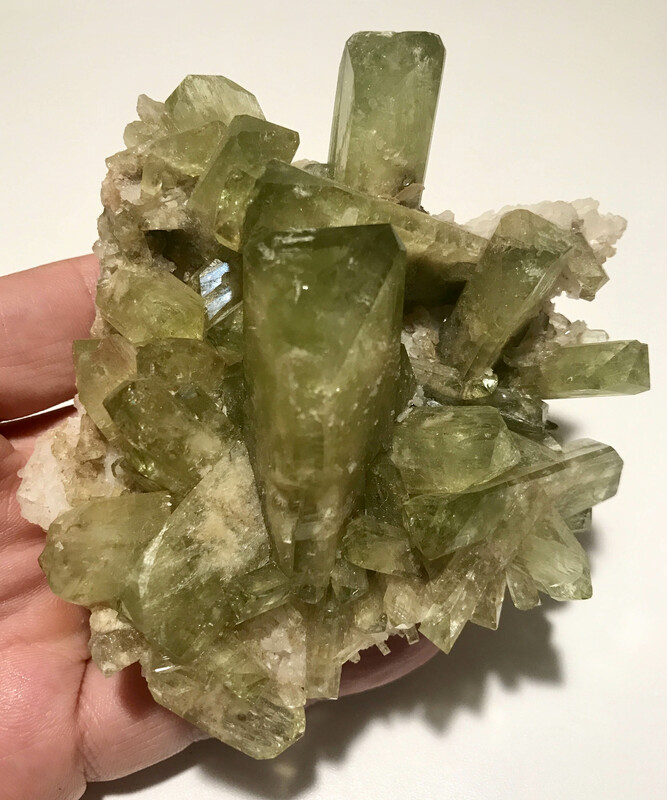 Over the last 20 years, I have been to and sold at well over 200 mineral shows, met thousands of collectors, and sold millions of dollars of minerals, like quartz crystals, tourmalines, dioptase, fluorite, topaz, and on and on. It’s common for people to be prejudiced around people and behavior they don’t understand, history is rife with examples. Metaphysics is basically a philosophical line of thinking that jumps off the empirical scientific measurement system. By definition it is unmeasurable and dwells in the nature of perception, experience, and feelings. It is more of an art than a scientific approach. Metaphysics seeks to investigate bigger questions, that physics currently can’t answer. In my business this often is experienced by people waving their hands over rocks that sit on a table. It may look weird, but it is meaningful to the person doing the waving! It’s quite common for me to hear other mineral dealers snicker behind their backs and call them “heelie-feelies.” These same dealers, typically keep their crappiest quality stuff to sell to them, and freely admit (to other dealers) this lowest class of material is — the “metaphysical” quality stones. 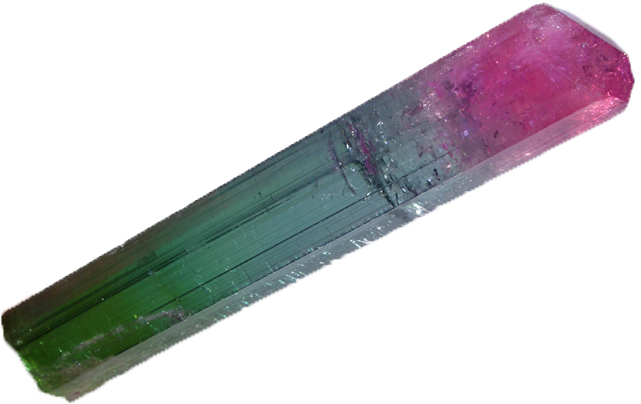 People interested in the stones’ energy, typically aren’t paying attention to its inherent qualities as a specimen (does it have a termination? a lack of damage? Is it a good example?). I sell minerals to hundreds of metaphysical practitioners and store owners every year. I explain to anyone with an interest, the virtues of a good crystal. I go to great lengths to procure excellent examples across a wide swath of values. I think the prejudiced dealers need to grow up and open their minds, (after all, we are conscious primates, traveling 1,000 miles per hour sitting still as the earth turns, orbiting a nearby star). Conversely, I think the metaphysical collectors need to become more grounded by learning the virtues of the specimens more; what makes this example of tourmaline special? Is it from a closed mine? Is it damaged or not? Is it rare or common? By doing so, they will make better purchases, and build a more valuable collection over time, with a much greater re-sale value in years to come. 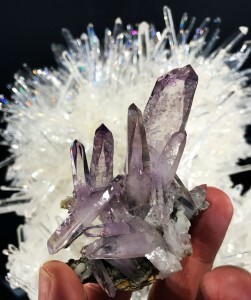 Also, I’ve gathered from numerous practitioners that intact, undamaged crystals make for superior metaphysical “tools” than damaged ones, and the best values are at mineral shows where the merits of the minerals are showcased and valued on a fair market basis and not jacked up for their alleged metaphysical values. There is a very long history of using stones for one’s health and well being, over the years I have had a conversation or two with religious fundamentalists, and I’ve pointed out the bible has many references to stones, including in the book of exodus; Aaron’s breast plate: a grid of 12 specific stones used to enhance discernment or good judgement to the high priest (what’s interesting is a seemingly metaphysical effect to a collection of specific stones outlined in the bible). Look down at your hands, this is you isn’t it? Your body is about 60% water. We all know how often we are drinking water and excreting water, this same process of exchange can be used as a model when considering that most of our cells die and are replaced within several days to months, some last years,(only some eye, brain, and central nervous system cells last a whole lifetime) but what we think of as our body is really a pattern or blueprint governed by DNA that is composed of the available elements around us, that we “borrow,” for awhile before returning to our environment. If we think of our bodies as a measuring tool, then imagine the home you are living inside: made of wood, sheetrock (gypsum), steel, paint, shingles… how long will it live, defined as a “house”? 40 years? 100 years? maybe 200? The elements of your house originate from trees, and mines, and are crafted and at the end burned down or demolished, or (hopefully) recycled somehow. All the elements in your body and the ones in your house are “borrowed” from our planet for a very short period of time. So what about crystals? 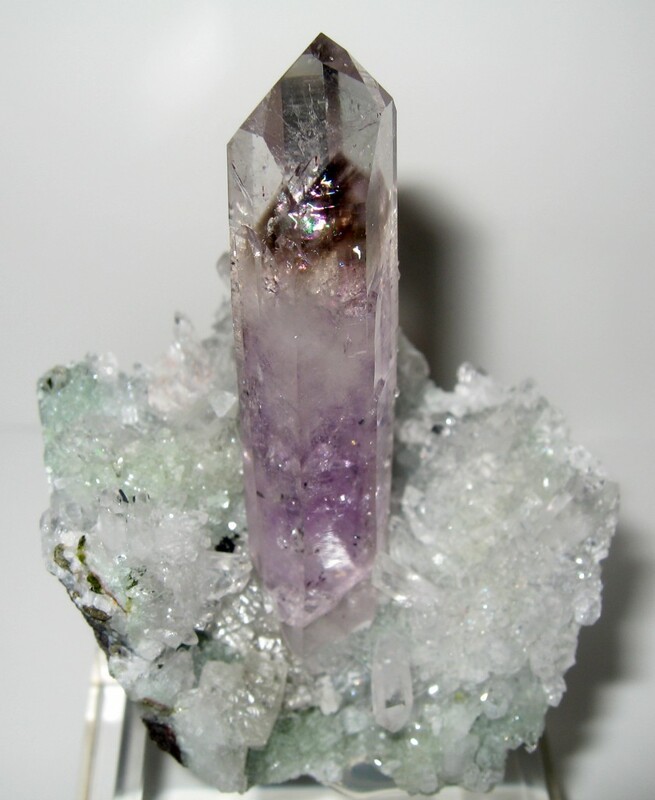 One of my favorite types is amethyst from the Brandberg district of Namibia. 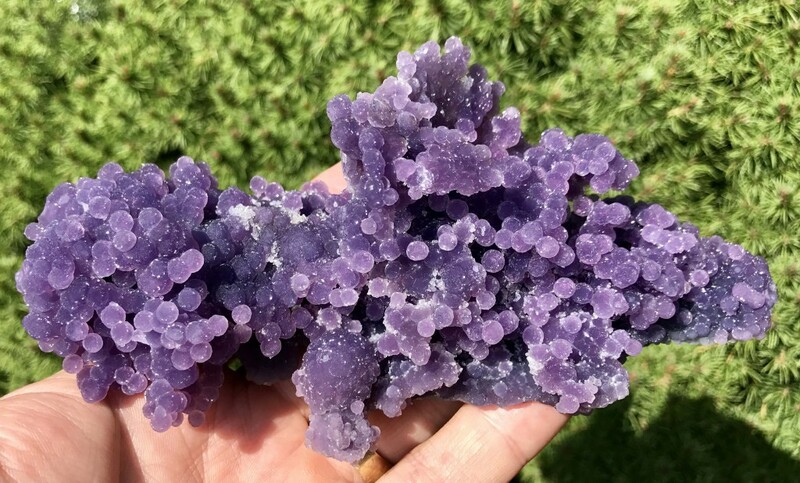 Small mines in the Namib desert produce some of the most spectacular amethyst in the world. The basalt that the pockets are found within have been dated to around 150 million years. The quartz crystallized then, which means these crystals have been intact in the same form for over 150 million years! These structures are so well formed, they maintain their “elemental sovereignty,” and have not exchanged elements (like our bodies) with the environment, even after being removed from their pegmatite homes. I have a carbonaceous carbonate type meteorite (Allende) that contains micro diamonds and has been intact in its form since the birth of the solar system (over 4 Billion years). Its an ugly rock, but holy S#@t is it cool to think about. Regardless, keeping an open mind and respecting other people’s beliefs is the way to go. I make an effort to educate people about minerals and crystals of all kinds. I often recommend customers “shop around,” and don’t buy everything from only one dealer, especially if you are buying online or through mail order. Educate yourself about market values, and qualities. Mineral shows are the best way to do this, as many dealers are under one roof and its very easy to shop around and compare different minerals and prices. To check out the Crystal Circle Web Site click here. We recently returned from Bancroft, Canada with 100 new flats of material from Hawthorneden Inc. 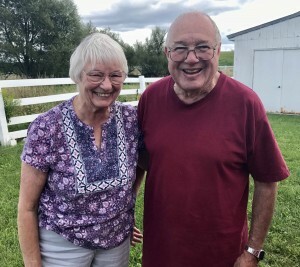 Friendly Canadian dealers Frank and Wendy Melanson, are officially retired after 50 years of being mineral dealers. We had first purchased their inventory ten years ago (500 flats) and they continued doing just two shows a year, but returning to Brazil and Europe periodically. 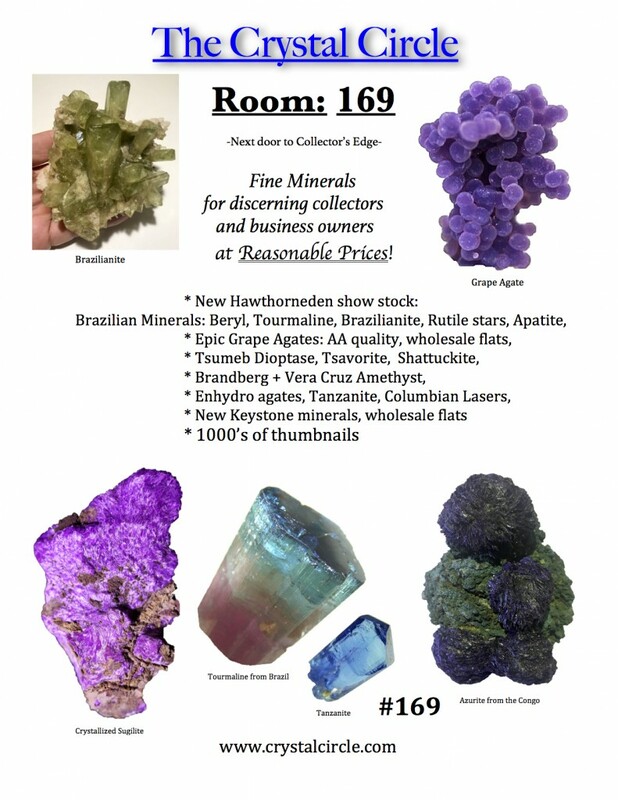 After ten years, the highlights are ALL too numerous to mention: Brazilianites, Rutile and Hematite, Rose Quartz, Heliodor and Aquamarine, bright Quartz, Kunzite, Tourmaline, Apatite, rich Amethyst, unusual Muscovites, 25 flats of new Thumbnail specimens…and much more. 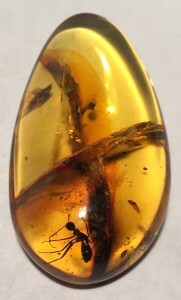 We are bringing the juiciest Grape Agates yet found from Indonesia, spectacular yellow, blue and green Prehnite, Azurite from the Congo, Crocoite, Rhodochrosite from Peru, Golden Selenite, Rhodonite from Brazil, New Chiapas Amber with Insects, Columbian Quartz, it’s the most we’ve had in 10 years!! Loads of new half price, and clearance flats. 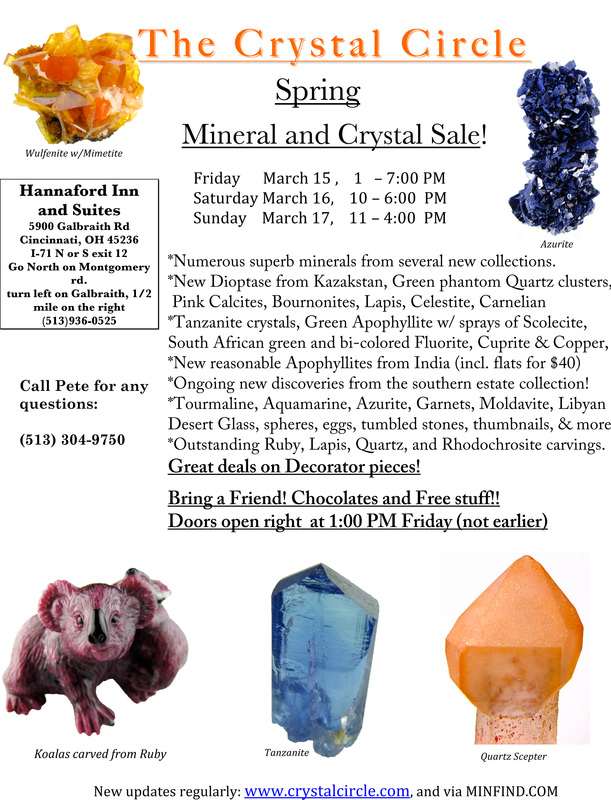 See us early for blow-out deals on discounted minerals! South facing entrance closest to Galbraith rd., right behind the Kenwood town center. OPEN TO THE PUBLIC, FREE ADMISSION, FREE PARKING, FREE CHOCOLATES!! The New York Gem and Mineral show is (to my knowledge) the only mineral show in downtown New York City. Tony at Excalibur Minerals runs the show, (http://www.excaliburmineral.com/shows.htm) with the support of the New York Mineral society and goes to significant effort to keep costs down for the dealers, as well as for the attendees ($6 entrance fee is cheap for any show, let alone NYC). It’s in the ballroom of the Holiday Inn on 440 west 57th st. midtown Manhattan. Unlike the NY/NJ Mineral, Fossil, Gem and Jewelry show that is at the NJ Expo Center in New Jersey, and run by Eons Expos, It’s not widely advertised, and many people in the area don’t know about it. It’s a cozy, worthwhile show, with good honest dealers, and a wonderful crowd of friendly knowledgeable club members who volunteer at the show to help educate guests which all makes for a fun outing to see some hard-to-find minerals in a city that has everything (else). I just returned from the Munich Mineral and gem show, and I’m preparing a new selection of choice specimens for the show. Something quite unique are several Azurite pseudomorphs after linarite from Morocco. 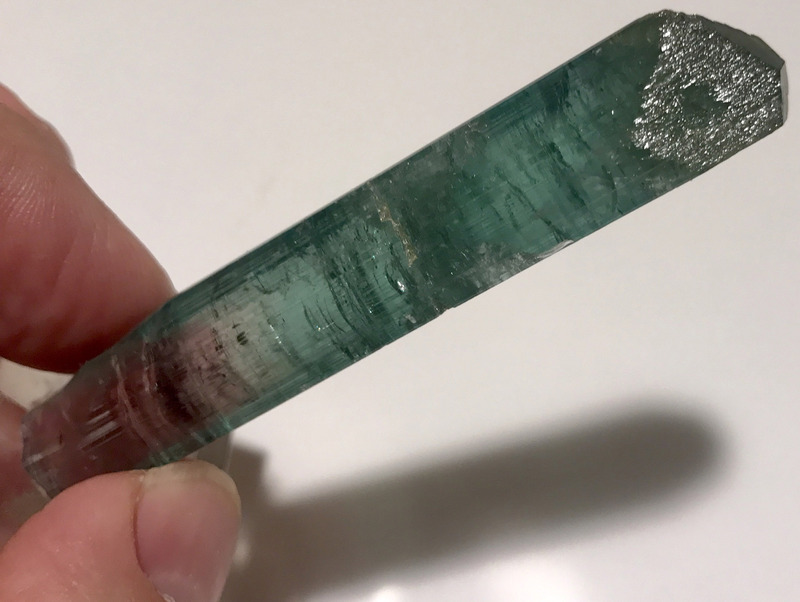 I have a great selection of Brandberg amethysts from Namibia, exquisitely clear Quartz from Penas Blancas, Columbia, a new kilo of emerald green Moldavites from Nesmen, Czech Republic, Gemmy yellow Libyan desert glass in all sizes. On the lapidary front, we have hundreds of new pendants including the best sunstone I’ve ever seen, moonstone, fluorite, and many more. I also recently picked up a collection of fetish carvings, and some interesting larger display pieces. 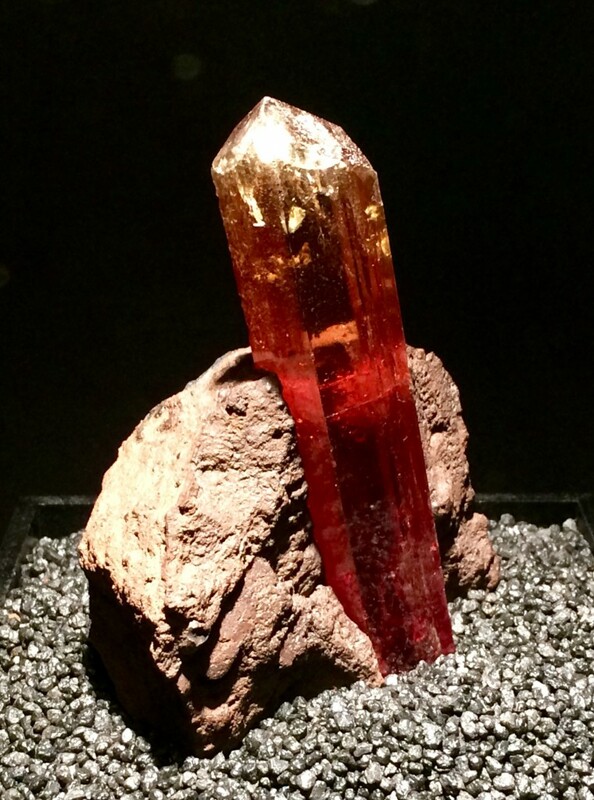 My favorite piece from the Munich display area: A spectacular 5″+ Imperial topaz in Matrix from Auro Preto, Brazil. 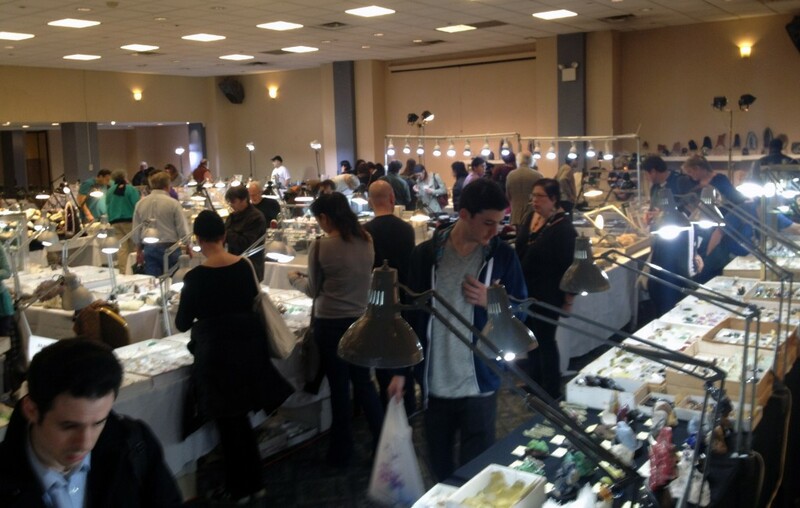 The New York Gem and Mineral show is (to my knowledge) the only mineral show in downtown New York City. Tony at Excalibur Minerals runs the show, (http://www.excaliburmineral.com/shows.htm) with the support of the New York Mineral society and goes to significant effort to keep costs down for the dealers, as well as for the attendees ($6 entrance fee is cheap for any show, let alone NYC). It’s in the ballroom of the Holiday Inn on 440 west 57th st. midtown Manhattan. It’s not widely advertised, and many people in the area don’t know about it. 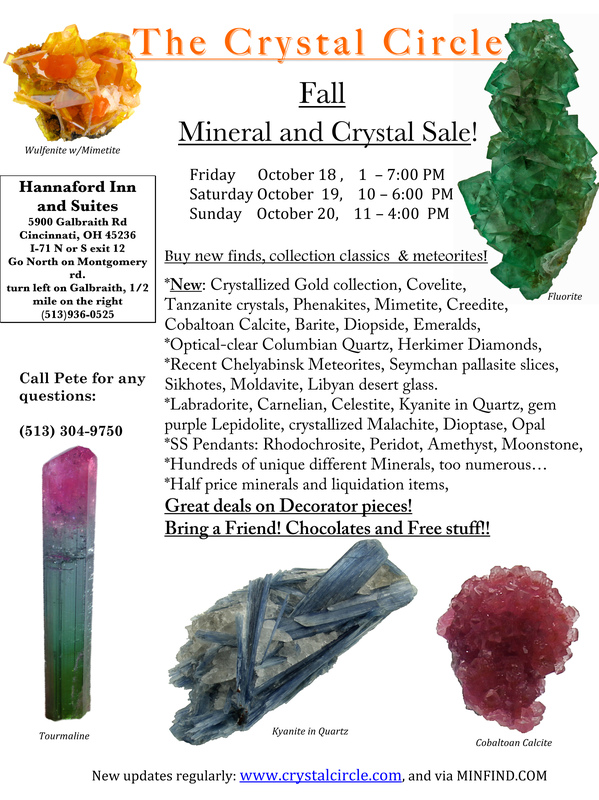 It is a worthwhile show, and makes for a fun outing to see some hard-to-find minerals in a city that has everything (else). We have been very fortunate recently to have acquired a treasure trove of new minerals from around the world. Pete’s recent travels to Europe and Colorado for major shows has lead to a wide selection of new finds and classic pieces. Too numerous to list here, you’ve just got to come to the show to see what we’ve brought. A range of new peridot crystals from the northern territories of Pakistan. We look forward to seeing our New York customers this weekend! 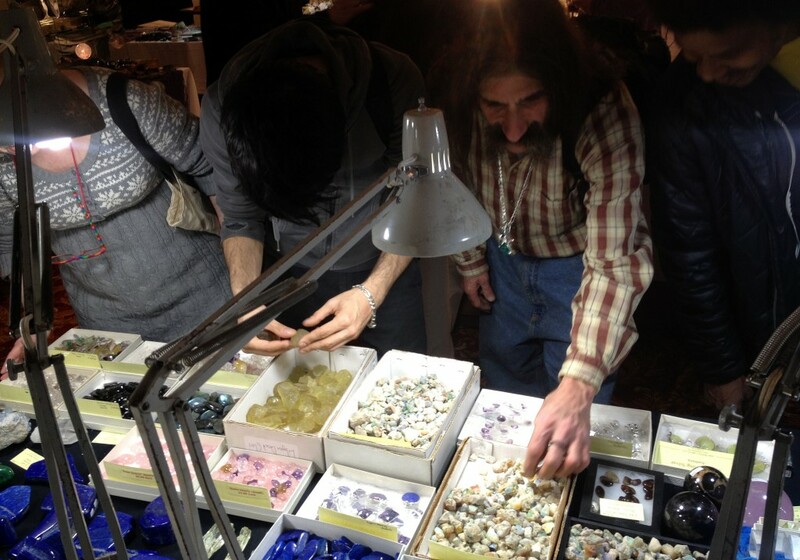 The 2013 New York City Gem, Mineral and Fossil Show in Midtown. Fall of 2013 hours are 10:00 AM to 6:00 PM on Saturday November 9th, 2013, and Sunday 11:00 AM to 5:00 PM Sunday November 10th, 2013. admission $6. 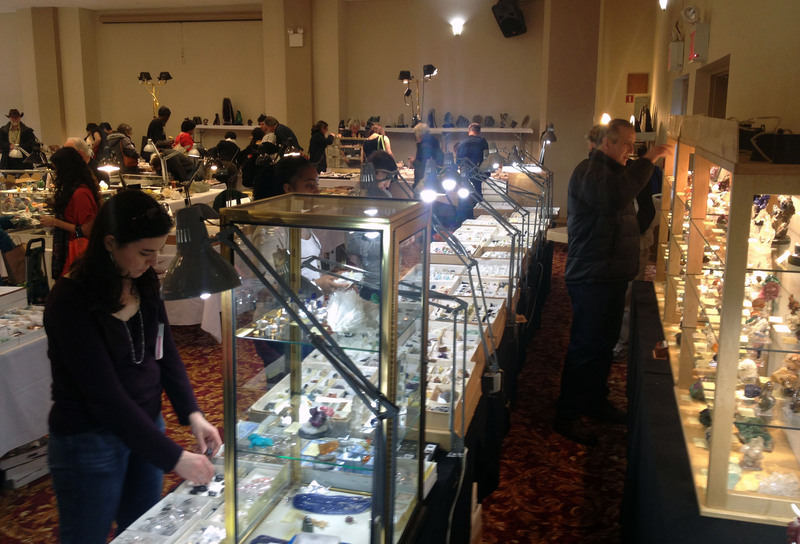 There are about 20 – 25 mineral and jewelry dealers, featuring several well known mineral dealers. We exhibit our minerals on 8 tables, including three custom made mineral showcases. I’m really looking forward to this show, we are loaded with lots of showcase-level minerals, and I’ll have my wife Wendy there with me for the first time. I always enjoy New York, it’s a great city with lots of friendly, interesting people (okay I’m probably biased by the friendly club members, and enthusiastic patrons). New Material we are bringing: Crystallized Gold specimens from a recently purchased collection, Covelite, dozens of fantastic Tanzanite crystals, Phenakites, Mimetite, Creedite, Cobaltoan Calcite, Barite, Diopside, Emeralds, Optical-clear Columbian Quartz, Herkimer Diamonds, Recent Chelyabinsk Meteorites, Seymchan pallasite slices, Sikhotes, Moldavite, Libyan desert glass. We’ve recently replenished our stock in : Labradorite, Carnelian, Celestite, Kyanite in Quartz, gem purple Lepidolite, crystallized Malachite, Dioptase, polished free form Ethiopian Opals.